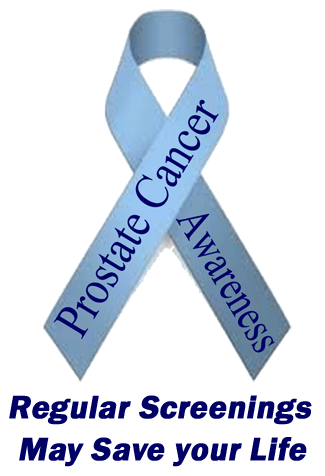 Prostate Cancer Awareness Month is September. Three million men in the United States are living with Prostate Cancer. For men whose cancer is confined to their prostate, the five year survival rate is almost 100 percent. For men with prostate cancer that has spread to other parts of the body, the five-year survival rate is 29 percent. 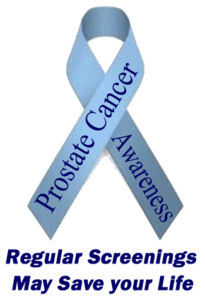 Prostate cancer is the third leading cause of cancer death in men in the United States. Nothing could be more important and easy than seeing a doctor or health care provider for a simple blood test (prostate-specific antigen or PSA) and a digital rectal exam (DRE). Despite this it is surprising learn that the PSA blood test for prostate cancer isn’t always part of a man’s annual physical exam. Many men actually refuse a digital rectal exam (DRE). It’s important to note that an elevated PSA level doesn’t necessarily indicate prostate cancer. It’s simply one of the initial warnings that more information is necessary for your physician to make a good decision. It is best to have a digital rectal exam (DRE) done at the same time as your doctor may detect an abnormal bump (possibly tumor) on your prostate. What men need to know is that a digital rectal exam (DRE) sounds much worse than it is. The same is true for a man’s first colonoscopy. Generally the first step toward a prostate cancer diagnosis is a biopsy. A prostate biopsy is an invasive procedure that involves a series of needles and puncture wounds to the prostate. Most men fear a biopsy of the prostate due to the fact that in the event cancer is present research has discovered that the biopsy increases inflammation and the progression and spread of cancer. Only 75 percent of cancers are detected via a patient’s initial biopsy. Often this leads to multiple invasive biopsies generally spaced from 6 weeks to three months apart. The more you know the more you will realize that there is no reason to fear a simple prostate screening. It could save your life. ** This news and information presented is about the disease. It does not provide medical advice, diagnosis or treatment. This content is not intended to be a substitute for professional medical advice, diagnosis, or treatment. Always seek the advice of your physician or other qualified health provider with any questions you may have regarding a medical condition. Never disregard professional medical advice or delay in seeking it because of something you have read on this website.